Mother's Day is a special day to celebrate our Mother's and all mother figures in our lives and also to celebrate being a mom..Every mother want's to feel extra loved on this special day.Caring for the family all year long, our Moms deserve the expression of our love.Going out is not a bed idea, but hosting a simple lunch at home for our mamas will make them fell extra special. So consider to make a surprise lunch or brunch for the special mamas in your life. 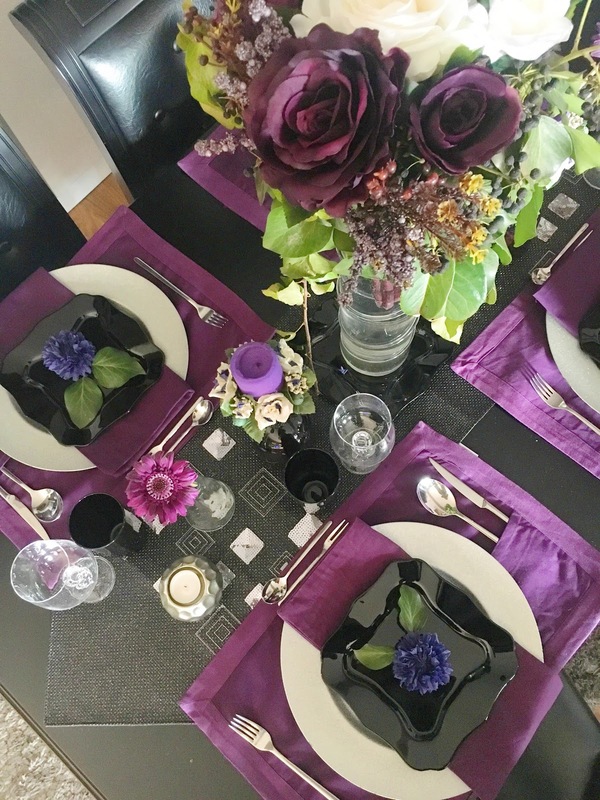 To run it successfully you should start by thinking about the table decoration.To help inspire your Mother's Day lunch I present you a wonderful idea for your table decoration.To really impress your mom check it out. When we think of the decoration of a dining table,the first thing that comes to our mind is the centerpiece of the table because it's the most important element that catches our eyes first.So when we think of mother's day the first thing that comes to our mind is FLOWERS.What could express the love of our mothers better than flowers?So it's a good idea to combine many kinds of flowers that you have. 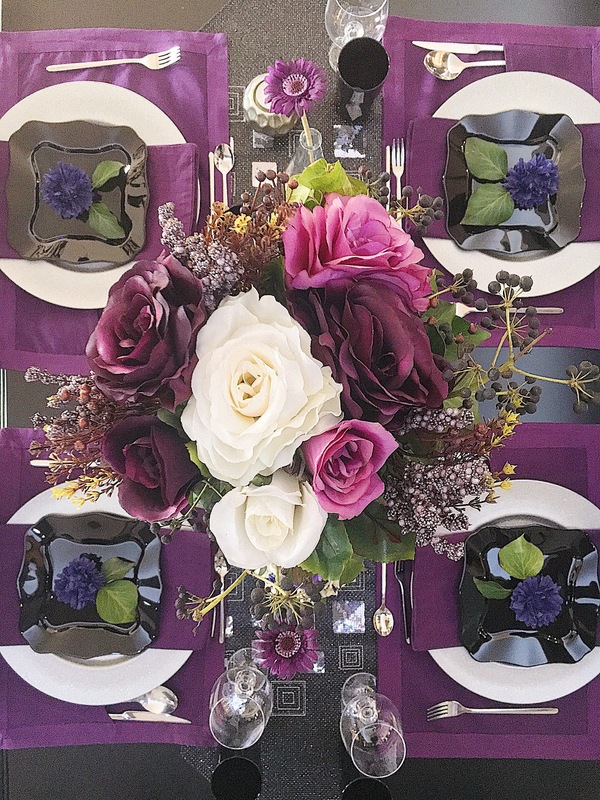 As the main color of this table decor I chose purple because is the most feminine and glamorous color for this occasion.The centerpiece flowers are combination of pink white and purple.It was hard to find purple flowers at this season....so... there ,might be a small secret with those roses. Even though they look amazingly real, these roses are faux.Only the greenery is fresh.You can find them at AliExpress for an everlasting arrangement or you can create this look with a dozen fresh roses as well. Each place is set with a silver charger,black edged plate and a little purple pom pom tissue paper flower on top.I love to put something crafty on my tables.Always top off a place setting with an interesting decor. Mother's Day is one of my favorite occasions,and I take this day to give thanks to the strength and unconditional live that mothers have. Becoming a mom was just the most incredible thing ever and is truly the best job in the world. Your table setting is just beautiful. Thanks for sharing at C&C with J&J. 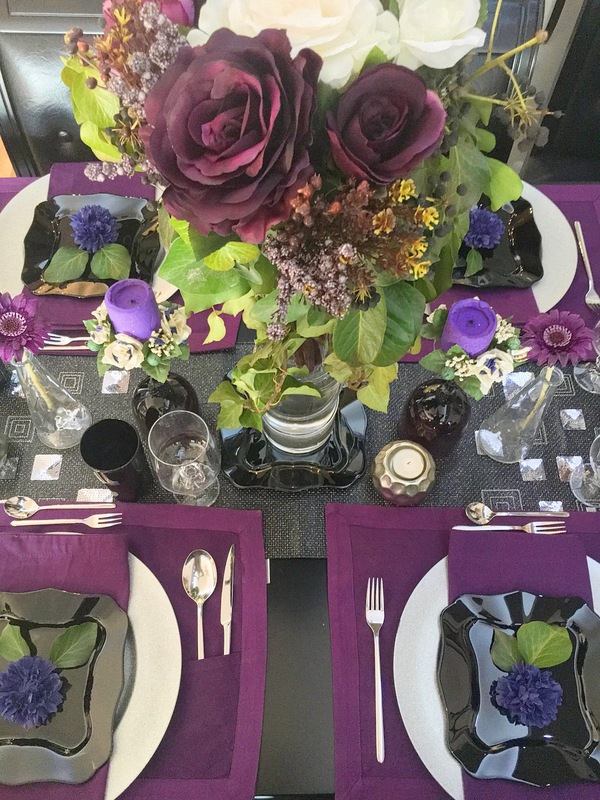 Well said that purple looks more feminine and glamorous color. You have arranged everything just perfectly. Now I am also thinking to throw a nice tea party at event venues Chicago on mother’s day and going to invite friends of my mom. Hope she will like my work.